Grandpa and Bubbie Send their Grandson, Ethan Jack born, 8/11/16 a Card that won’t fit in an Envelope? The cost of a Stork Sign is similar to flowers, but the memory will last forever! 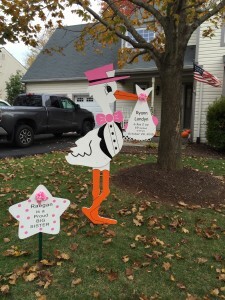 Order a Flying Storks Yard Sign Birth Announcement. 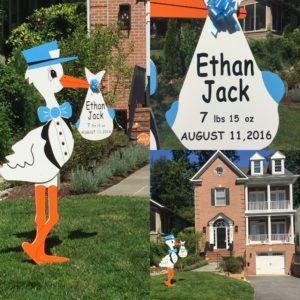 Call us at (301) 606-3091 for additional information or to order your stork sign today! We serve the greater Frederick, Maryland area & areas surrounding Gaithersburg, Maryland, including: Adamstown, Beallsville, Bethesda, Boyds, Braddock Heights, Brunswick, Boyds, Clarksburg, Damascus, Darnestown, Dickerson, Gaithersburg, Germantown, Green Valley, Ijamsville, Jefferson, Monrovia, Myersville, Middletown, Mt. Airy, North Potomac, North Rockville, Potomac, Point of Rocks, Poolesville, Urbana, Walkersville, as well as all of Montgomery & Frederick County, MD. Call us at (301) 606-3091 for more information or to book your stork rental today! Please visit us on FB & Instagram to see our most current rentals. Follow us on Pinterest too.